For many years, Nick has applied his craft to the wines produced at l’Ameillaud. Maturity, generosity and balance are a few of the key words to describe them. The aromatic potential of the Rhône Valley grape varieties that compose the wines of the domain finds its natural expression through the fermentation process. The Grenache, Syrah and Carignan grapes complement themselves generously to obtain this fruit expression along with a certain level of tannic support which allow them to mature well. 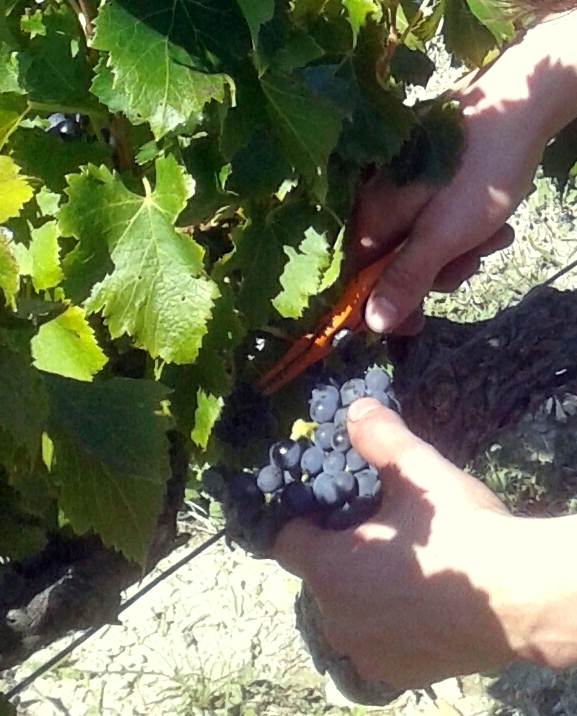 Grapes are hand picked in order to ensure the best quality of berries when they arrive at the cellar. Although the vineyard constitutes a single holding surrounding the property’s buildings and cellar, the great diversity of type and subsoils lay the foundations to our different “cuvées”. The subsoil, an ancient sea-shelf, is essentially made-up of clay and limestone, but depending on the parcels, one finds marle, sandstome, marine molasse and silt. Blend :Grenache 60%, Syrah 30%, Carignan 10%. Ageing : 25% in oak cask for one year. Dark red colour with a purple taint. An expressive nose with ripe fruit, black berries, black current, cherry and Kirsch. The palate opens on volume and softness with good fat. Silky tannins. A powerful finish with good length. One finds notes of spice, "garrigues" and candied sugar. Deep colour with purple highlights. Also minerality. A very onctuous mouth with a sensation of fullness and sucrosity. Round, soft tannins. One finds liquorice and hints of vanilla. It’s a soft wine, without no agressivity, easy and generous. Intense colour, garnet hue with an expressive nose, red fruits, ripe fruit, blackcurrent aromas with spices and orange zest. Round pallet, with a tense but pretty structure and silky tanins. A deep, garnet-red colour. A soft, slightly sweet nose with notes of black cherries and blackberries. The palate offers liquorice flavours. A well-structured wine with good concentration and youthful tannins. A wine offering good maturing potential. Dark colour, with a purple huwe. Mature fruit flavours on the nose, prunes and cooked raspberries, with a touch of kirch. A certain minerality on the palate. Spicy aromas, orange peel, finishing on black chocolate. A generous, full-bodied wine with mature tannins. Whether you are a private customer or a professional, live in the region or are just passing by, you are welcome to taste the domain’s wines and learn about the domain’s story... Bienvenue! You can taste the full range of our wines at the property. Opening hours run from Monday to Saturday, from 8.30am to 6.30pm. For a visit on a Sunday, please call to fix an appointment. Wine lovers are invited to participate in tastings organised by Nick. By appointment. You will learn about the history of viticulture in the region, a vine's growth cycle, cultivation techniques and wine making. More information on demand. Prices per bottle including taxes and transport in France. Minimum order of 12 bottles. Up to 24 bottles order, extra charge of 45€ for transport. As from 400€ order a discount will be applied. Please enquire. To order, please complete the form. Upon receipt of order and payment by cheque, order will be shipped.